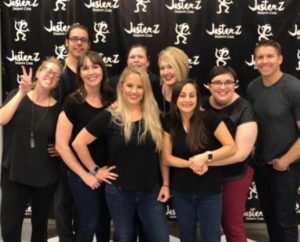 Adult Improv Level 1 - 8 Weeks + Performance! Course Length: 8 Weeks + A BONUS Week Performance Showcase! Our beginning Improv class is designed to teach basic improvisational skills through different exercises and games. Students can anticipate a safe environment where they can express ideas, receive feedback, and be treated with respect from other students and instructors. You'll be learning such topics as Yes, And, Space/Object Work, exposition, among other things. Improv is your chance to push yourself and see what you're truly capable of. This class (and all classes at JesterZ) are appropriate for all. No profanity or off-color content allowed. We push our students to be creative without being "dirty" or "blue".